Always love hearing about JetMoto. Great insight! Fantastic post. I was obsessed with Jet Moto in my early teenage years, and to this day it is still among my favorite games of all time. I distinctly recall the subtle inclusion of “rider’s choice” way back when, and I always thought it was cool how the game embraced diversity within its own world without trying to make a big, politically correct spectacle about it. Still my favorite game. I loooooved Wild Ride, my favorite racer. 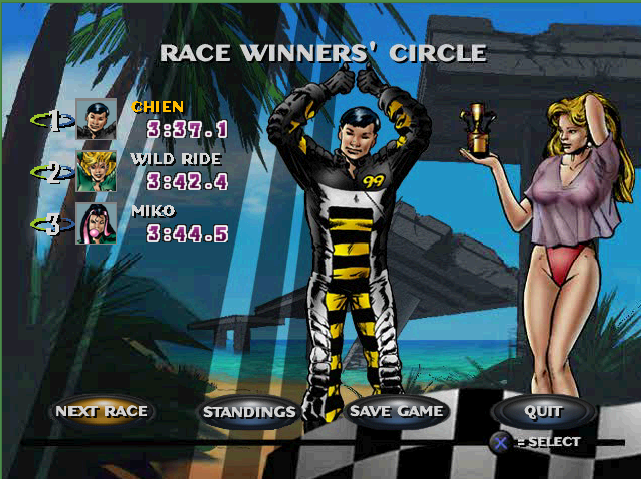 I would also acknowledge that the computer made several of the female racers top ranking in the AI. Wild Ride, Dakota, Miko and Quick Jessie will often be on the left side of the ranking, and are just as good as the best male riders. So, after approximately week of “struggling” (sorry. “overcoming”).